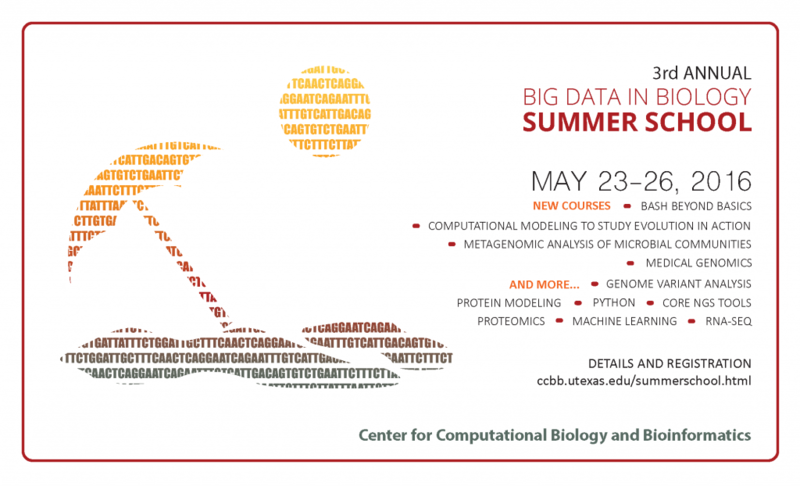 The Center for Computational Biology and Bioinformatics at The University of Texas at Austin is proud to host the 3rd Annual Big Data in Biology Summer School May 23–26, 2016. The 2016 Summer School offers eleven intensive courses that span general programming, high throughput DNA and RNA sequencing analysis, proteomics, and computational modeling. These courses provide a unique hands-on opportunity to acquire valuable skills directly from experts in the field. Each course will meet for three hours a day for four days (either in the morning or in the afternoon) for a total of twelve hours. UT Austin and BEACON students, faculty and staff receive a great discount off the regular fee! This year a number of BEACONites are participating as instructors, TAs, or organizers. They include: Laurie Alvarez, Dhivya Arasappan, Daniel Deatherage, Emily Dolson, Nicole Elmer, Benjamin Goetz, Rayna Harris, Arend Hintze, Hans Hofmann, Sean Leonard, Kasie Raymann, and Stephanie Spielman. We would like to acknowledge BEACON for supporting the Computational Modeling to Study Evolution in Action course taught by Arend and Emily. Bash Beyond Basics: This course will focus on being more productive in the Bash shell. We will learn about regular expressions, Unix utilities like cut/sort/join, awk, advanced piping, process substitution, string manipulation, and Bash scripting. Learn to love the command line and increase your productivity with rapid manipulation of bioinformatic data! Metagenomic Analysis of Microbial Communities: This course surveys the Python software ecosystem and familiarizes participants with cutting-edge data science tools. Topics include interactive computing basics; data preprocessing and cleaning; exploratory data analysis and visualization; and machine learning and predictive modeling. Clinical Genomics: This course will introduce a selection of genomics methodologies in a clinical and medical context. We will cover genomics data processing and interpretation, quantitative genetics, association between variants and clinical outcomes, cancer genomics, and the ethics/regulatory considerations of developing medical genomics tools for clinicians. The course will have an optional lab component where participants will have the opportunity to explore datasets and learn basic genomics and clinical data analysis. Computational Modeling to Study Evolution in Action: This class is about the study of evolution using computational model systems. We will use two different systems for digital evolution: Avida and “Markov Gate Networks” exploring many different possibilities of using computational systems for evolution research. Participants will gain a hands-on introduction to the Avida Digital Evolution Research Platform, a popular artificial life system for biological research and the Markov Gate Network modeling framework to study questions pertaining to neuro-evolution, behavior, and artificial intelligence. This entry was posted in BEACON Researchers at Work, BEACONites, Education, Member Announcements and tagged BEACON Researchers at Work, big data, Education, genetics, genomics, phylogenetics. Bookmark the permalink.